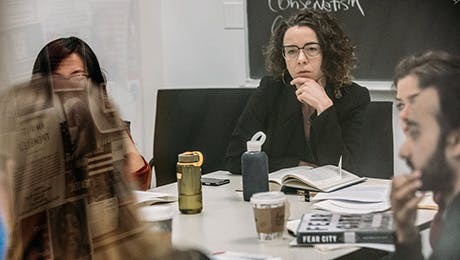 The Graduate Certificate in Gender and Sexuality Studies is a university-wide program that brings together faculty and courses from across The New School. The program is designed to foster intellectual collaboration on the study of gender and sexuality among students and faculty representing a variety of disciplines. Learn to recognize and respond to questions such as: What is gender? How is sexuality culturally constructed? How do attitudes toward gender affect individual experience, artifact design, artistic production, and modes of social organization? How do we respond to gender-based claims of injustice? What does social justice looks like in a gendered (or post-gendered) world? Visit the Gender and Sexuality blog to learn about the program, events, and the students. Learn more about course requirements for the Graduate Certificate in Gender and Sexuality Studies.